Have you ever walked with a loved one who was preparing for death? Are you struggling with the meaning of the experience and how it has changed you forever? 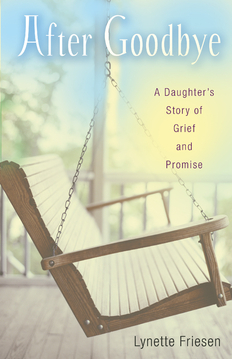 In After Goodbye, author Lynette Friesen shares her spiritual journey, with its struggles and challenges, through the last years of her mother's life. Chapter by chapter she provides detailed accounts of various aspects of her mother's diminishment. Her open, familiar, and insightful telling permits the reader to participate through the recognition of shared experience. In revealing the depths of her own spiritual struggle, Friesen invites others to reflect on theirs and provides questions after each chapter to help facilitate the process. After Goodbye offers a window to self-reflection, encouraging readers to explore and share their own stories of caregiving and grieving.